In 2008, the Swiss people had pay out massive sums to save the country’s largest bank from collapse due to the toxic assets it had foolishly amassed in the U.S. The Government bought most of UBS, so that it was in effect nationalised. The Swiss National Bank granted it a large loan and created a “bad bank” into which the toxic assets were dumped. As a result, the Swiss people took on the sizeable risk that the bank would never recover and all their investment would go down the drain. Yet in 2010, the Government was able to sell its share in the bank at a modest profit. Now UBS has almost repaid the loan from the National Bank, which moreover has agreed to the bank taking back all the assets dumped in the “bad bank.” These have regained considerable value as a result of the recovery of the U.S. housing market. Neue Zuercher Zeitung worked out that what the people have earned through the substantial interest charged on the loan and the National Bank’s share of the profits on the resurrected toxic assets will by year-end reach 6.5 billion Swiss francs ($7 billion). Since 2011, the Swiss National Bank also bought huge amounts of foreign currency to prevent the Swiss franc appreciating too much – it had firmed from 1.55 to the euro in 2008 to 1.05. It set a base of 1.20 and announced it would sell any amount of Swiss francs to prevent further appreciation. After nearly a year bumping along the floor, the currency has eased to 1.23, and so when the National Bank decides to mop up the Swiss francs, it will repurchase them at less than it sold them for. Together with the profit on re-privatising the bank, this would take the earnings of the people in this affair to around 10 billion francs ($11 billion) or more. So a bank bailout can be profitable, not just a drain on the people’s wealth for the benefit of reckless banks. Why has it worked out this way for Switzerland, while in other countries such as Spain, Portugal and Greece, bailouts caused investors to lose faith in the solvency of the governments themselves? In Switzerland, public finances were solid, and so foreign investors never doubted the capability of the state to assume the bailout burden. Secondly, Swiss companies are geared to high-quality and precision goods, which are not particularly price-sensitive. A liberal policy on immigration enabled it to import highly-qualified labour to keep standards high. Not rocket science, but a focus on prudence and quality which has paid off. Is a new bubble in risky investments on the way? As I used to report on the Bank for International Settlements (BIS) as a financial journalist in Switzerland, I remain interested in certain clients it has (they’re all central banks). Take Argentina for example. It holds nearly all its reserves at the BIS, which is unusual – most other central banks keep about 4%. Argentina does this because at the BIS its money is protected from attachment by unpaid creditors. I’ll return to this in a later blog. It’s the subject of arcane arguments in American courts at present. If you look at http://blogs.reuters.com/felix-salmon/tag/argentina/, you’ll see what I mean. Paraguay is another case, and it’s more topical – see my two recent blogs. It holds all its reserves at the BIS, also to protect them from creditors it decided not to pay. Last week that did not deter a good number of investors from subscribing to Paraguay’s first-ever public international bond issue. The risk is theirs, you may say. However it does uncannily remind me of the years leading up to the crash of 2008, when banks sold little-explained investment vehicles to gullible investors who did not understand them and asked no questions because of their greed for high yields. In Paraguay’s case, lead manager Citibank did not inform subscribers in the prospectus that the country keeps all its reserves at the BIS, let alone why. So if the next Paraguayan government repudiates the debt – this has happened several times in the past and the next election is in April – investors were not made aware that a key means of legal redress is blocked. The ratings agencies were not much put out by this. S&P’s BB- rating and Moody’s Ba3 seem not too bad. I received no answer, even though the Central Bank had been communicating with me before. Towards the end of last year, Paraguayan ministers were saying in the local media the bond would be launched in mid-February. Now it has popped out just after the New Year. Looks like a rushed job. Are we at the start of a new cycle of peddling dubious assets which nobody can quite fathom? History shows repentance never lasts more than a few years. I sense the first puffs into a new bubble. 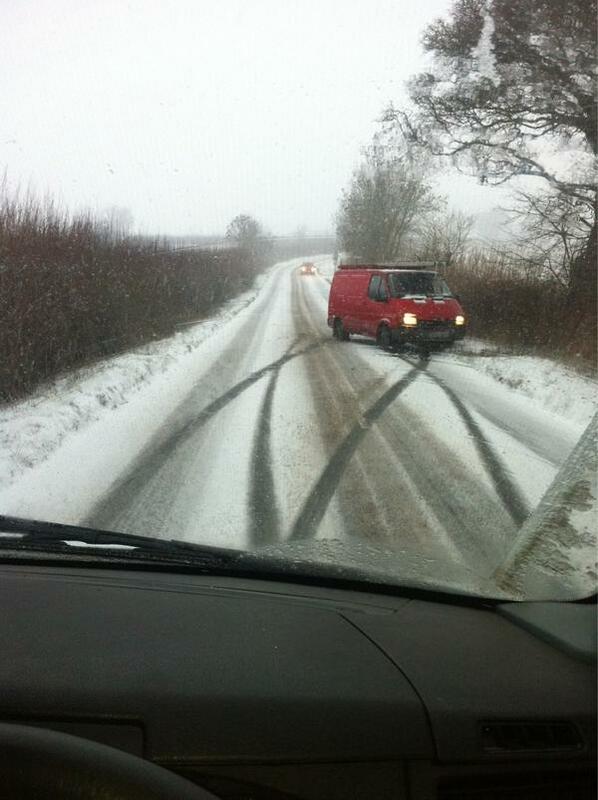 Here’s a picture of British driving in the latest snow. All over the place, even on a flat road. And why? Certainly because winter tyres are scarcely used at all in this country. In many countries on the continent of Europe, winter tyres are mandatory at this time of the year. The Swiss rule that vehicles must be “adapted to the conditions.” That means winter tyres when the conditions require. If you have an accident without winter tyres, you can fined or lose your insurance cover. Isn’t that expensive? Not much. During winter, you don’t wear down your summer tyres. The main cost is to have a garage change them over twice a year. The savings in less damage make up for this – and you are safer. Winter tyres are not effective just in snow and ice. At any temperature from 7 Celsius downwards, winter tyres grip better. Yesterday I wrote about Paraguay and its piano and why investors should beware this dubious country planning to make its first public international bond issue ($500 million). Today I see that the deal is almost done and dusted. I also see that Barclays are the only ones to issue a word of caution. I wonder why this has been rushed out only three months before a new government is elected in Paraguay, all the more since the country has a long history of one government repudiating the debts of a previous one. 1 – Why were investors not told that Paraguay has for years kept its funds safe at the Bank for International Settlements (BIS) in Basle because it is immune from legal attachment from creditors (not vulture funds in the case of Paraguay)? 2 – Why were investors not told that Paraguay will continue to keep its money protected at the BIS and therefore, in the event of the new government reneging on payments for the bond, a judgment against it will be worthless for enforcement purposes? 3 – Although the prospectus did mention a list of problem creditors, why did it not state clearly that they all refer to undertakings by one government repudiated by another? 4 – In view of allegations by the leading candidate for the Presidency in Paraguay about corruption in the current government http://www.abc.com.py/edicion-impresa/politica/federico-franco-y-la-primera-dama-con-una-fuerte-contestacion-a-cartes-528578.html, what guarantee is there for investors that a new administration will not declare the bond issue fraudulent and that Citibank should have known better? 5 – Why were investors not told what it costs Paraguay to keep its money protected at the BIS? 6 – What difference would it make to the economy of Paraguay if the bond issue was delayed until after the elections in April and proceeded with the backing of the new government which should be in power for five years? After all the current government is temporary, its mandate dubious and not widely recognized until the elections in April. Northern Europe may not fire the imagination, but five countries in that region are in the top 10 worldwide measured by economic competitiveness, according to the World Economic Forum (WEF). They are Finland, Sweden, the Netherlands, Germany and the UK. Southern European countries, struggling to cope in the eurozone, languish far back (Spain 36th), but are stabilising their positions due to austerity measures, says the WEF’s latest survey. In Asia, Singapore, Hong Kong, Japan and Taiwan are the top 20. China may be a powerhouse but competitively it is back in 29th place. Credit Suisse has just forecast that after growth of 0.5% this year, Switzerland’s economy will grow strongly again next year. The moral? Perhaps it’s that you get on well if you are solid and hard-working, but not necessarily hugely inspiring. Whilst I’ve been away from the UK in Europe, I’ve crossed frontiers a dozen times, and never had to show a passport or identity card, nor declare goods to customs. Eurozone citizens crossing with me did not have to lose money through changing currencies. I lost 8% to the money-changers by having to change sterling. When I return to the UK on Sunday, I will have show an identity card at Trieste airport as I leave the Schengen zone. When I arrive in the UK two hours later, I will have to queue to show my identity card again. I’m still trying to discover the supposed benefits of British insularity. Our currency is devalued far more than the euro is. Staying outside Schengen means we are excluded from sharing of security information. Nobody likes too much regulation, but that’s not the sole preserve of the European Union – national governments do it too. Democratic accountability in the EU? Maybe not great, but Britain has a first-past-the-post voting system that usually gives exclusive power to a party winning around a third of the votes. Not supremely democratic either. At least I have not only British nationality, but also Swiss, so like most Europeans I can travel around with a small plastic identity card in my wallet rather than a passport. Switzerland doesn’t even belong to the EU, but it has adapted itself to many EU norms and remains safe even after opening up its frontiers within Schengen. In most respects I love living in England, the place where I was born and grew up, so I’m working hard on my insularity. But for the moment, I don’t quite get it. Just now, I find European harmonisation liberating and convenient. Switzerland’s economy grew by 0.7% in the first quarter of 2012, after 0.5% and 0.3% in the last two quarters of 2011. The Swiss did this without having first to rein in excessive government spending. Nor is the government running a big economic stimulation programme. Switzerland’s direct democracy, which provides for citizens to vote on practically any issue affecting their lives, may be a factor. Voters know that if they take the easy way in spending, they will have to take painful decisions later. There is no escape from the consequences and nobody else to blame. This could be why budgets do not get out of control. Unlike truculent Britain, Switzerland is pragmatic in its relations with European neighbours. It does not belong to the European Union, but has bilateral agreements aligning it with most of EU legislation. Switzerland belongs to the Schengen agreement, so its frontiers are open to EU citizens. With a few temporary exceptions, Europeans can freely immigrate to work in Switzerland. As a result, there is a plentiful supply of highly-qualified workers. Local analysts consider this is one important reason why Swiss companies succeed well in export markets. As if to underline the point, the latest report from the International Institute for Management Development (IMD) ranked Switzerland third behind Hong Kong and the United States in economic competitiveness. Germany is ninth and the rest of Europe nowhere. Responsible, steady and open to the world – perhaps this tiny country has lessons for all of us. The European Union, the IMF and other creditors have decided to help Greece avoid default on its sovereign debt, but is a default really out of the question? A number of other countries have found it quite convenient to remain in default for 10 years or more. Recent history suggests Latin America may be an inspiration for that. Take Argentina for an example. It is no stranger to defaults. Its central bank holds most of its reserves at the Bank for International Settlements (BIS) in Switzerland. This is because of its last default on its international debt 10 years ago The BIS has a special legal status as the “central banks’ bank,” backed by immunity provided by the Swiss government, preventing creditors from seizing a debtor country’s assets held there. With its attachable assets safely at the BIS, Argentina has settled with 93% of its creditors at a fraction of the original claims, but the remaining 7% are still making vigorous efforts to seize its assets all over the world. Hence Argentina’s continuing need for the BIS. However the BIS arrangement has a price – the bank pays only around 0.4 % of interest. If the reserves were held conventionally, Argentina could be earning about 2%. The estimated loss is about $675 million per year. The Argentinian people already suffered enormously in the financial crisis which led to the default. I was in Buenos Aires at the time. A thief attacked me as I left my hotel and tried to wrestle my watch off me. Queues of destitute people waited for free handouts of food from restaurants and supermarkets. The losses on the BIS arrangement in the end mean further losses for the people. Another example on a smaller scale is Paraguay, which failed to pay back money it raised from Swiss banks in the 1980s. It is in default since it failed to conform with a Swiss court judgment of 2005 that it must honour a Paraguayan government guarantee given to the banks. So it too has chosen to park its reserves with the BIS. Not only does Paraguay forfeit interest – some $100 million per year – but it recently revealed that it was also paying 9 million dollars a year of professional fees to keep the arrangement going. So the Paraguayan people have to put up with financing these losses year after year, while the BIS protection prevents the Swiss banks from recovering their loans. Many central banks keep funds at the BIS for entirely legitimate reasons, but the worldwide average is 4% of reserves. One may wonder why the BIS wishes to protect debt defaulters whose assets a court may otherwise be justified in seizing. It is unlikely to explain. When I covered it as a Reuters correspondent in the past, it consistently refused to discuss its affairs. Greece may not be out of the woods. Could it yet be tempted by these Latin American precedents? My local butcher in Oxford, England, has a sign in his window “No euro: keep our pound.” That is about the level of debate on the euro’s travails on this offshore island of Europe. Of course, if the butcher had taken euros three years ago and kept them, he would be sitting on a 25% gain against the pound. The euro clearly is in trouble, and efforts of European leaders to manage the crisis are not impressive. British media pour scorn on them and it is taken for granted Britain is better out of it. Maybe, but only maybe. Britain has rising unemployment, 5% inflation, no economic growth, faltering exports, a very weak currency and persistently huge budget deficits. So misgovernment rules on the island too, perhaps even a little more. The European Union was built on slow consensus-building from the start. That is what made it successful. Disparate peoples were not forced to accept more than they were comfortable with. So the European Union finds it difficult to reach decisions all subscribe to. Democracy prevails, not the smack of firm government, but that is not necessarily bad. Rather than longing for a quick and final solution, I prefer to watch the process as an experiment which is charting new waters. I am fascinated by the debates over austerity v. pump-priming, price stability v. printing money, supranational v. local fiscal discipline, and who eventually calls the tune. Unable to know infallibly which way to jump on most of these issues, I sit and learn by watching what goes on. Eventually, I see Germany’s qualities of hard work, thrift and efficiency coming to the fore. He who pays the piper calls the tune. An impeccably pacifist Germany holding more sway over the way we run our economies seems not a bad prospect. I forecast the euro will stay, and in 10 years time will be used by more states than now. You read it here first. Canadian police fined Swiss ski jumping gold medallist Simon Ammann 138 dollars for speeding. Quite right. Those crazy guys need showing who’s in charge. They caught him on the road heading for a TV studio for an interview. Pity they did not measure him on the ski trampoline too. They could have fined him twice. I mean: jumping off a huge steep hill into mid-air? Reckless. Asking for trouble. Obviously a misfit.